It’s impossible to say how much a real hoverboard, like the one seen in Back to the Future II, costs because none are currently commercially available. On the other hand, the prices for scooters calling themselves hoverboards can start from as little as $300. Looking for a real hoverboard? Let’s quickly look at the costs of three other products that are aiming for a true Back to the Future style hoverboard experience. The ArcaBoard is the latest product with buzz in the hoverboard space. With an eye-watering price tag of nearly $20,000, it won’t be cheap, but it aims to give a true hoverboard experience. If you haven’t heard of the Hendo Hoverboard, it raised $510,590 on Kickstarter to build an actual working hoverboard. It’s not yet available, but 11 backers pledged $10,000 each to be among the first group of people to own a real, working hoverboard. The Hoverboard by Hoverboard technologies is another product seeking funding via Kickstarter. 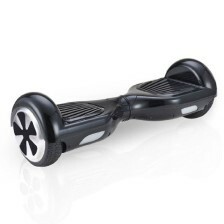 However, unlike the Hendo, it’s not really a true hoverboard. Instead it’s more like an advanced self balancing electric unicycle skateboard. As of writing this, it was still a long way from reaching its funding target of $500,000 and so may never come to life. However, if it does the first 100 will be given to backers who pledged $3,775. While these products are not quite hoverboards, in the Back to the Future sense, they have the big advantage of existing today. Prices can vary widely depending on make, model and brand. For example, the most popular of these products is the IO Hawk. It also happens to be the most expensive at nearly $1,800. On the other hand, many near identical scooters can be bought for as little as $300. * Please note: prices for these products were accurate at the time of publishing but may have changed since then.